Welcome to the Pierre Viret Association. 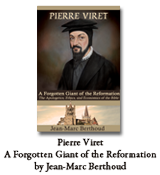 Pierre Viret is often called the “Forgotten Reformer” of the Protestant Reformation. Our hope is that as you browse this site you will begin to uncover the greatness and depth of the Christian character and theological scholarship of Pierre Viret. Pierre (Peter) Viret was an extraordinary man and a model minister. He was a blend of gracious Christian character and remarkable theological insight and balance. His theology went beyond the abstract and touched life itself. From the authority of Scripture to the role of the magistrates, Viret made theology applicable to all of human existence. 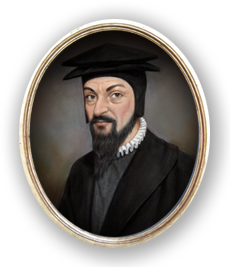 Viret’s works on apologetics, biblical law, ethics, economics, and political philosophy were influential during the times of the Reformation. His theological expertise in these realms is as timely in our modern era as it was in his. Theodore de Beze's poem is the symbol of our vision at the Pierre Viret Association. 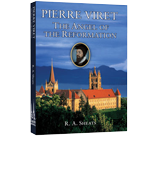 Our goal is to further equip Christ's Church by making available the beautiful writings of the forgotten reformer, Pierre Viret.